Here you will find answers to frequently asked questions about our concept and services. Our concept is a hybrid version of permanent employment and offshoring. We have strongly focused on providing long term solution and direct contact between clients and remote staff. What types of talents do you provide? 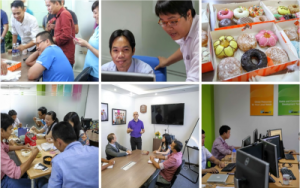 We provide talents in the IT sector from developers, scrum masters, testers, project managers, IT-admin, IT architects and more. What qualifications do the staff posses? They possess the skills you require. We find out your requirements and seek professionals matching your specific needs. We focus on seeking individuals who have senior level experience from international companies. Moreover, we are always looking for pro-active, self-driven and solution oriented people. Which technologies do you specialise in? Our focus is to find, select and employ the right people with right attitude for you. Vietnam is politically and economically stable. In general, Vietnamese are hardworking, sincere, competent and adaptive to other cultures. From our experience working with people around the world we concluded that this cannot be taken for granted. Moreover, South East Asia as a region has enormous human capital. What responsibilities as a provider do you undertake ? We handle all administrative and other tasks in regards to employment in Vietnam. In addition, we place all your remote staff in an environment which mirrors your organisation. Inculcating them with your ideas and values, creating a mindset that is compatible with yours. Depending on your requirements, it normally takes 1.5 to 3 months, from the search and selection process till the day your staff starts working for you at our office. Are we involved in the interview phase? It all depends on you, whether you want to be part of the whole interview process or just parts of it. We recommend that you participate in at least one interview with the candidates, afterall you are the one going to work with them, so it is critical that they match your needs and are compatible with you.